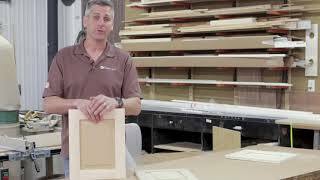 I just watched your video on MDF vs Solid Wood for painted cabinet doors. The speaker did not address how mdf responds to nicks, scratches and other such damage. How does the homeowner repair? And what does the damage look like when this occurs vs. wood. it responds to nicks and damage about the same as a wood like Cherry might. Since it is only used for paint, you would simply touch up any damage with paint, perhaps filling any nick with a wood filler first. Damage is easier to conceal than on stained wood as you dont need to worry about wood tone or grain affecting final color. Painted MDF will look just like painted wood once repaired. No difference.